All medical device manufacturers struggle to keep up with government regulation, pressures to speed innovation, increased global competition, and supply chain complexities. 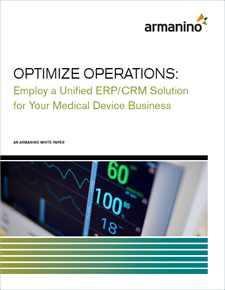 “Optimize Operations: Employ a Unified ERP/CRM Solution for Your Business” is a white paper that will help you to address these time-draining and expensive challenges for your company. It also offers a succinct case study of radiation oncology manufacturer Accuray who had been relying on numerous paper-based processes, as well as 18 disparate systems, most of which did not support the unique requirements of the life sciences industry. With the implementation of a unified ERP/CRM system from Armanino, Accuray consolidated 46 business processes and passed an FDA audit just three months after the system went live. To download a copy of this informative white paper, complete the form below. Address time-draining and expensive challenges for your company through unifying your ERP and CRM systems. Evaluation* ---- Please Select ----0-6 Months7-12 Months12+ MonthsNot At This Time My firm is evaluating ERP/CRM solutions and upgrades.